You need a roasting pan large enough to hold the bird with some space around the edges, an instant-read meat thermometer (essential), and foil. Don’t depend on the pop-up thermometer implanted in the turkey breast; they pop up when the bird is already overcooked. You’ll also need a platter to transfer the bird to after cooking it so you can make gravy with the juices in the roasting pan (see recipe). The night before you roast the turkey, remove the gizzards from both the vent end and the neck end. Pat the bird dry. Sprinkle it inside and out with salt and pepper; this is a dry brine, which seasons the meat. Then let the turkey sit uncovered (yes, without a wrap of any sort) so the skin dries out and turns super crisp the next day. For cooking times, see this chart. 1. Remove the giblets from both the neck and vent ends of the bird. Wipe the bird inside and out with paper towels. Sprinkle the inside and outside with salt and pepper. Set it in a roasting pan and refrigerate overnight uncovered (no wrap at all). 2. 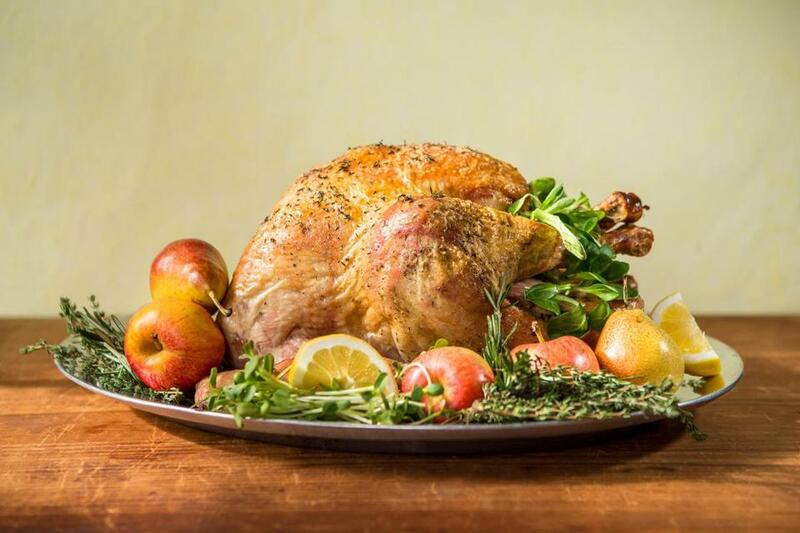 Before cooking the turkey the next day, let it sit at room temperature for 30 minutes. 4. Tuck a handful of onion and lemon pieces into the cavity of the turkey. Using your hands, rub the bird all over with vegetable oil. 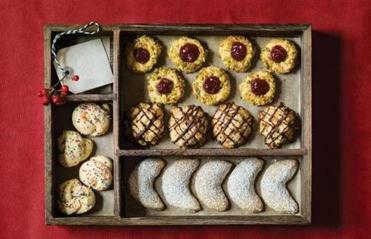 Recipes for classic holiday cookies with an extra-special ingredient: nostalgia. 5. In a bowl, stir the rosemary, thyme, and oregano with the olive oil. Tuck the herb mixture between the skin and flesh of the bird at the breast end. To do this, ease your hand under the skin at the neck end and push in the herb mixture. Set the remaining onions, lemons, and carrots in the roasting pan. Turn the turkey breast side up on the vegetables; they will act like a rack. With kitchen twine, tie the legs together. Add 1 cup water to the pan. You need enough water to make a very thin layer in the pan; add more if needed. 6. Transfer the turkey to the oven and after the first hour, baste it every 30 to 40 minutes with the juices in the pan. Turn the pan from back to front once during roasting. If your bird is on the small side, you can roast it breast down for the first hour, then turn it breast up to finish cooking. Or roast it breast up the entire time, covering it loosely with a foil tent once it starts to brown. 7. Roast (see chart for times) until a meat thermometer registers 165 degrees when inserted into the bird in three places — the inside of the thigh, the thickest part of the breast, and under the wing. If the turkey reaches the correct temperature sooner than you expected (this is common), remove it from the oven and transfer to a large warm platter. Set it in a warm place. When you remove the bird from the oven it needs to rest for at least 30 minutes before carving. If it isn’t brown enough, turn the oven up to 400 degrees for the last 20 minutes.